Christmas Countdown 2012: 29 days! Only 29 days left until Christmas! I don’t know about you, but a slight tinge of panic is starting to set in. November just flew by, didn’t it? Today’s countdown features the only Christmas song ever to hit #1 on Billboard’s U.S. singles chart. 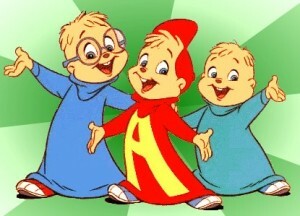 The Chipmunk Song by David Seville and The Chipmunks held the much-coveted #1 spot during the last two weeks of 1958 and the first two weeks of 1959. To find out more behind the history of the song, click here. ← Christmas Countdown 2012: 30 days!